Miami Heat’s Udonis Haslem talks about his role with the team and how much he loves his city. Dion Waiters ties his career high with 33 points, Goran Dragic adds 25 as the Heat top the Bucks at home. Luol Deng and D'Angelo Russell each score 19 points as the Lakers defeat the Heat 127-100. 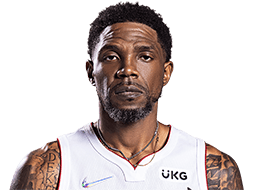 Udonis Haslem gets the rebound and converts inside. Andre Drummond tallies in 25 points with 18 rebounds, Reggie Jackson adds 27 points in a New Years Day victory for the Pistons against the Heat. Dwayne Wade scores 13 points in his return to Miami as the Bulls take down the Heat, 98-95. Kyle Lowry heats up for 25 points with 10 rebounds as the Raptors take Game 5 over the Heat, 99-91. Kyle Lowry lead the Raptors to a 95-91 victory in Miami to take a 2-1 series lead. Kyle Lowry scores 33 points, grabs two rebounds and dishes two assists as the Raptors defeat the Heat in Game 3, 95-91. Udonis Haslem feeds a cutting Dwyane Wade for the one-handed dunk. Dwyane Wade drives and drops the ball to Udonis Haslem who finishes while drawing the foul. Dwyane Wade grabs 24 points with 6 rebounds as the Heat beat the Raptors in overtime, 102-96. Goran Dragic scores 25 points, Hassan Whiteside adds 10 with 12 boards and five blocks as Miami advances past Charlotte, 106-73. Joe Johnson lights it up in the fourth quarter scoring 25 points to power Miami over Detroit, 99-93. Udonis Haslem joins in on the Heat block party. Check out the top 10 plays from Monday's pre-season action. Has appeared in 830 games (498 starts) during his 14-year NBA career and has averaged 7.8 points, 6.9 rebounds, 0.9 assists and 25.7 minutes while shooting 49.1 percent from the floor and 75.6 percent from the foul line…has missed 133 games due to injury, five for personal reasons, two as a healthy scratch on the inactive list and was a DNP-CD on 162 occasions…has served as team captain each of the past 10 seasons, the longest tenure as a captain in HEAT history…his 14 seasons as a member of the HEAT are a franchise record…has scored in double figures on 300 occasions with 21 games of at least 20 points…his longest streak of consecutive double-figure scoring games is nine (Dec. 6-20, 2007)…has grabbed double-figure rebounds on 206 occasions and has posted 133 double-doubles…his longest streak of grabbing double-figure rebounds in consecutive games is six (Mar. 31-Apr. 11, 2010)…his longest streak of consecutive double-doubles is four and has occurred twice (Nov. 27-Dec. 5, 2006 and Apr. 3-11, 2010)…led the NBA in 2009-10 in double-doubles off the bench (21) and is Miami’s all-time leader in double-doubles off the bench (35)…is Miami’s all-time leader in offensive rebounds, defensive rebounds and total rebounds and ranks among the HEAT’s all-time leaders in games played (2nd), starts (2nd), minutes (2nd), double-doubles (3rd), field goals made (5th), field goals attempted (6th), points (7th), field goal percentage (7th), free throws made (8th), free throws attempted (8th), double-figure scoring efforts (8th), blocks (9th), steals (10th), assists (16th) and free throw percentage (18th)…is the only undrafted player in NBA history to lead a franchise in total rebounds…played a career-high 113 consecutive games from Jan. 13, 2004-Mar. 19, 2005 and also had a streak of 111 consecutive games played from Feb. 6, 2006-Apr. 8, 2007 making him one of only two players in HEAT history to have two streaks of at least 110 consecutive games played joining Grant Long…led Miami in total rebounds and defensive rebounds in five consecutive seasons (2005-10) and offensive rebounds and rebound average in four straight seasons from 2006-10…joined Rony Seikaly (1989-94) as the only players to lead Miami in total rebounds in five consecutive seasons…is the only player to lead the HEAT in offensive, defensive and total rebounds in four straight seasons…his four consecutive years leading Miami in offensive rebounds is a franchise record…has led the HEAT in offensive rebounds six different seasons, the most in franchise history…topped Miami in starts in three consecutive seasons from 2004-07, joining Glen Rice as the only HEAT players to accomplish that feat…led the HEAT in double-doubles in four consecutive seasons from 2006-10…has led the team in charges drawn in six of the 12 seasons Miami has kept the stat…his high for consecutive free throws made is 29 (Apr. 15-Nov. 9, 2005)…his high for most free throws made in a game without a miss is 12 (at Milwaukee on Dec. 8, 2004)…his high for most field goals made in a game without a miss is six (vs. Toronto on Apr. 11, 2006)…has 318 career dunks…has 43 double-figure scoring quarters…has topped the HEAT in scoring 11 times, in rebounds on 273 occasions and in minutes played 55 times…has recorded 81 multi-steal games and 33 multi-block games…his career high for most consecutive games with a steal is eight (Nov. 14-30, 2007)…has seen action in 147 NBA postseason games (84 starts) and has averaged 5.7 points, 5.6 rebounds and 21.7 minutes while shooting 48 percent from the floor and 71.3 percent from the foul line…has scored in double figures 35 times in postseason play and grabbed double-figure rebounds 26 times…has 16 postseason double-doubles…is Miami’s all-time postseason leader in offensive rebounds and also ranks among the HEAT’s all-time postseason leaders in games played (2nd), total rebounds (2nd), minutes (3rd), starts (3rd), defensive rebounds (3rd), double-doubles (4th), field goals made (5th), field goals attempted (5th), free throws made (5th), steals (5th), dunks (5th), points (6th), free throws attempted (6th), double-figure scoring efforts (tied-6th), blocks (7th) and assists (10th). 2017-18 SEASON: Came off the bench in all 14 games in which he appeared for the HEAT and averaged 0.6 points (.200 FG%, .500 FT%), 0.7 rebounds and 5.1 minutes…served as a team tri-captain with Goran Dragić and James Johnson, marking his franchise-record 11th consecutive season as team captain…did not miss any games due to injury, but was a DNP-CD on 66 occasions and missed two other games (Jan. 25 and Feb. 2) due to personal reasons…finished third in the voting for the NBA’s Twyman-Stokes Teammate of the Year award…led the HEAT in blocks once…topped the Miami reserves in blocks, assists and plus/minus once each…Season Highs: Three points (vs. Brooklyn, Dec. 29), two rebounds (vs. Washington, Mar. 10), two assists (twice), one block (twice) and 13:06 minutes (vs. New Orleans, Dec. 23). 2016-17 SEASON: Came off the bench in all 16 games in which he appeared for the HEAT and averaged 1.9 points (.478 FG%, .600 FT%), 2.3 rebounds and 8.1 minutes…served as the lone captain on the team, marking his franchise-record 10th consecutive season as team captain…did not miss any games due to injury but was a DNP-CD on 65 occasions and missed one game (Dec. 9 at Cleveland) for personal reasons…finished third in the voting for the Twyman-Stokes Teammate of the Year award which is voted on by the league’s players…led the HEAT in plus/minus once…topped the HEAT reserves in assists, steals and plus/minus twice each and in rebounds once…Season Highs: Seven points (at Sacramento, Jan. 4), six rebounds (vs. Detroit, Jan. 1), two assists (twice), two steals (at Milwaukee, Jan. 13), one block (at Sacramento, Jan. 4) and 20:43 minutes (vs. Detroit, Jan. 1). 2015-16 SEASON: Came off the bench in all 37 games in which he appeared in for the HEAT and averaged 1.6 points (.377 FG%, .750 FT%), 2.0 rebounds and 7.0 minutes…served as a team tri-captain with Dwyane Wade and Chris Bosh…did not miss any games due to injury but was a DNP-CD on 45 occasions…topped the team in plus/minus three times, in steals twice and in rebounds once…was Miami’s leading scorer off the bench once and also topped the HEAT reserves in steals four times, in rebounds on three occasions and in blocks twice…played in his 800th career game at Brooklyn on Jan. 26…Season Highs: Seven points (twice), nine rebounds (at Toronto, Jan. 22), two assists (at Washington, Jan. 20), one steal (four times), one block (two times) and 21:58 minutes (at Brooklyn, Jan. 26). 2014-15 SEASON: Saw action in 62 games (25 starts) for the HEAT and averaged 4.2 points (.448 FG%, .703 FT%), 4.2 rebounds and 16.0 minutes…served as a team co-captain along with Dwyane Wade, which marked his franchise-record eighth season as a HEAT captain, surpassing the record of seven seasons which he shared with Alonzo Mourning…officially missed five games due to injury/illness and was listed as a DNP-CD on 15 occasions including three games in which he dressed but was injured…missed the first five games of the season due to a left quad strain with three games (Nov. 1-4) officially missed due to injury and the first (Oct. 29) and fifth game (Nov. 5) he was listed as a DNP-CD…sat out a pair of games (Mar. 31-Apr. 2) due to illness…led the HEAT in charges drawn (16) for the sixth time in his career…topped the HEAT in rebounds seven times, in steals six times, in blocks on five occasions and in minutes twice…led the HEAT reserves in scoring, minutes, assists and blocks three times each and also 15 times in rebounds and seven times in steals…scored in double figures six times…grabbed double-figure rebounds on three occasions and tallied three double-doubles…reached the 20,000-minute milestone for his career on Nov. 8 vs. Minnesota…grabbed his 4,000th career defensive rebound on Apr. 9 vs. Chicago…hit the first three-point field goal of his career at New York on Feb. 20…Season Highs: 18 points (vs. Detroit, Mar. 29), 13 rebounds (vs. Detroit, Mar. 29), three assists (twice), three steals (twice), two blocks (at Indiana, Apr. 5) and 38:09 minutes (at Boston, Mar. 25). 2013-14 SEASON: Appeared in 46 games (18 starts) for the HEAT and averaged 3.8 points (507 FG%, .568 FT%), 3.8 rebounds and 14.2 minutes…was a team co-captain along with Dwyane Wade, marking his seventh consecutive year serving as a team captain tying Alonzo Mourning’s franchise record…missed five games due to injury/illness and 31 as a DNP-CD…missed three games due to back spasms (Nov. 9 and Nov. 15-16) and a pair of games (Apr. 8-9) with a stomach virus…became Miami’s all-time offensive rebound leader on Apr. 11 vs. Indiana surpassing Alonzo Mourning (1,505)…ranked second on the team in charges drawn (17)…topped the HEAT in scoring once, in blocks on seven occasions, in rebounds six times and in steals twice…led the HEAT reserves in rebounds eight times, in blocks four times and in minutes, assists and steals once each…scored in double figures four times and grabbed double-figure rebounds on three occasions…grabbed his 1,500th offensive rebound vs. Milwaukee on Apr. 2…scored his 6,000th career point at Portland on Dec. 28…appeared in his 700th career game vs. Washington on Mar. 10…matched his career high with three blocks at Charlotte on Jan. 18…Season Highs: 17 points (at Detroit, Mar. 28), 11 rebounds (vs. New York, Apr. 6), three assists (at Boston, Mar. 19), three blocks (at Charlotte, Jan. 18), two steals (twice) and 31:16 minutes (vs. Indiana, Apr. 11). 2012-13 SEASON: Started 59 of the 75 games in which he appeared for the HEAT and averaged 3.9 points (.514 FG%, .711 FT%), 5.4 rebounds and 18.9 minutes…was a team co-captain along with Dwyane Wade…missed a total of seven games due to injury/ illness…sat out four games with a sprained right ankle (Apr. 10-15) and one game each for a cold (Dec. 10), a neck contusion (Dec. 29) and a right leg contusion (Feb. 14)…led the HEAT in charges drawn (28) for the second consecutive season and the fourth time in the last six years…finished tied for second on the team in offensive rebounds and third in defensive and total rebounds…topped the HEAT in rebounds on 11 occasions, in steals six times and in blocks in three contests…with eight rebounds vs. Milwaukee on Nov. 21 he surpassed Alonzo Mourning (4,807) and became the HEAT’s all-time leading rebounder becoming the only undrafted player in NBA history to become the all-time rebound leader for any franchise…closed the season ranked fourth all-time in NBA history for rebounds by undrafted players (5,154) trailing only Moses Malone (16,212), Ben Wallace (10,482) and Brad Miller (6,199)…scored in double figures on six occasions and grabbed double-figure rebounds nine times…posted one double-double…made his 400th career start vs. Washington on Dec. 15…Season Highs: 13 points (vs. Washington, Dec. 15), 15 rebounds (vs. Milwaukee, Apr. 9), three assists (vs. Cleveland, Nov. 24), three steals (twice), two blocks (at Memphis, Nov. 11) and 30:26 minutes (vs. Utah, Dec. 22). 2011-12 SEASON: Appeared in 64 games (10 starts) for Miami and averaged 6.0 points (.423 FG%, .814 FT%), 7.3 rebounds and 24.8 minutes…was a team co-captain along with Dwyane Wade…missed one game with a stomach virus (Apr. 13) and one game for personal reasons…ranked among the NBA leaders in defensive rebounds (26th), total rebounds (29th) and rebounds per game (32nd)…led the HEAT in offensive rebounds for a franchise-record sixth time in his career…led Miami in charges drawn (25) and double-figure rebound efforts (18)…ranked second on the team in total rebounds and third in defensive rebounds…set a single-season career high in free throw percentage…topped the HEAT in rebounds a team-high 25 times, in blocks on eight occasions, in steals four times and in minutes once…led the HEAT reserves in scoring 18 times, in rebounds on 41 occasions and in minutes 28 times…scored in double figures 11 times and grabbed double-figure rebounds on 18 occasions…recorded four double-doubles…became Miami’s all-time leader in defensive rebounds on Apr. 3 vs. Philadelphia…Season Highs: 16 points (vs. Dallas, Mar. 29), 15 rebounds (vs. Washington, Apr. 21), four steals (vs. Atlanta, Mar. 7), three blocks (vs. Houston, Apr. 22), two assists (seven times) and 46:44 minutes (vs. Atlanta, Jan. 5). 2010-11 SEASON: Came off the bench in all 13 games in which he saw action for Miami and averaged 8.0 points (.512 FG%, .800 FT%), 8.2 rebounds and 26.5 minutes…was a team co-captain along with Dwyane Wade…missed the final 69 games of the season (Nov. 22-Apr. 13) after suffering a torn Lisfranc ligament in his left foot at Memphis on Nov. 20…had surgery to repair the ligament on Nov. 23…topped the HEAT in rebounds seven times, in steals twice and in blocks once…was Miami’s leading scorer off the bench three times and topped the HEAT reserves in rebounds 11 times and in minutes on seven occasions…scored in double figures on four occasions, including one 20- point performance…grabbed double-figure rebounds six times and recorded four double-doubles… Season Highs: 21 points (vs. Boston, Nov. 11), 11 rebounds (twice), two assists (vs. New Jersey, Nov. 6), two steals (twice), one block (three times) and 36:46 minutes (vs. Toronto, Nov. 13). 2009-10 SEASON: Came off the bench in each of the 78 games in which he appeared for the HEAT and averaged 9.9 points (.494 FG%, .762 FT%), 8.1 rebounds and 27.9 minutes…was a team co-captain along with Dwyane Wade…sat out a pair of games (Nov. 18-20) with a left shoulder strain and one game (Mar. 22) with a sprained right ankle…also sat out one game (Apr. 14) as a healthy scratch on the inactive list…led the NBA in double-doubles off the bench (21)…ranked among the NBA leaders in rebounds per game (22nd), defensive rebounds (25th), total rebounds (27th), field goal percentage (32nd), double-doubles (tied-36th) and offensive rebounds (38th)…led the HEAT in offensive rebounds, defensive rebounds, total rebounds, rebound average and double-doubles… ranked second on the team in field goal percentage and charges drawn and tied for second in games played…topped the HEAT in scoring once, in rebounds a team-high 33 times, in blocks eight times and in minutes and steals three times each…was Miami’s leading scorer off the bench a team-high 41 times and also topped the HEAT’s non-starters in rebounds 63 times and in minutes 52 times…scored in double figures on 41 occasions, including three 20-point efforts…grabbed double-figure rebounds a team-high 26 times…the 26 games in which he grabbed double-figure rebounds off the bench were the most in the NBA since Tyson Chandler grabbed double-figure rebounds 33 times off the bench during the 2004-05 season…additionally his 629 rebounds were the most in a season off the bench since Chandler grabbed 693 in 2004-05…grabbed double-figure rebounds in a career-high six consecutive games from Mar. 31-Apr. 11…his string of 12 consecutive field goal attempts made from Mar. 28-31 was the high on the HEAT in 2009- 10…matched his career high in points with 28 vs. New Jersey on Nov. 14 while setting a career high in field goals made (12)…grabbed 18 rebounds (matching his career high), including a career-high 16 defensive rebounds at Milwaukee on Mar. 26…scored his 5,000th career point vs. the L.A. Clippers on Mar. 10…grabbed his 4,000th career rebound at Charlotte on Mar. 9…played in his 500th career game vs. Atlanta on Mar. 6…hit a game-winning 14-foot jumper with 1.6 seconds left at Philadelphia on Apr. 12 to give the HEAT a two-point win…hit a game-winning 15-foot jumper with 15.4 seconds left to give the HEAT a one-point win over New Orleans on Nov. 22…Season Highs: 28 points (vs. New Jersey, Nov. 14), 18 rebounds (at Milwaukee, Mar. 26), five assists (at Houston, Jan. 15), three steals (at New York, Apr. 11), two blocks (twice) and 39:32 minutes (at Toronto, Jan. 27). 2008-09 SEASON: Started each of the 75 games in which he appeared for the HEAT and averaged 10.6 points (.518 FG%, .753 FT%), 8.2 rebounds, 1.1 assists and 34.1 minutes…was a team co-captain with Dwyane Wade…missed the final six games of the regular season (Apr. 4-15) after lacerating his right thumb on the backboard at Charlotte trying to block a shot on Apr. 3…was a healthy scratch on the inactive list once due to personal reasons…ranked among the NBA leaders in field goal percentage (17th), rebound average (tied-18th), defensive rebounds (21st), total rebounds (24th), double-doubles (tied- 28th) and offensive rebounds (tied-33rd)…led the HEAT in offensive rebounds, defensive rebounds, total rebounds, rebound average, field goal percentage and charges taken and tied for the team lead in double-doubles…led the HEAT in rebounds a team-high 37 times, in minutes on nine occasions, in blocks six times and in steals in three games…scored in double figures a career-high 49 times, including a pair of 20-point performances…grabbed double-figure rebounds a team-high 26 times and tallied 20 double-doubles…played a career-high 53:21 in Miami’s triple-overtime win over Utah on Mar. 14…recorded his 100th career double-double with 16 points and 12 rebounds vs. Milwaukee on Mar. 28…Season Highs: 23 points (at New York, Oct. 29), 15 rebounds (at Oklahoma City, Jan. 18), five assists (vs. L.A. Clippers, Feb. 2), three steals (three times), three blocks (at L.A. Clippers, Nov. 29) and 53:21 minutes (vs. Utah, Mar. 14). 2007-08 SEASON: Started 48 of the 49 games in which he appeared for the HEAT and averaged 12.0 points (.467 FG%, .810 FT%), 9.0 rebounds, 1.4 assists and 36.8 minutes…was the HEAT’s lone captain…missed a total of 26 games due to injury, one for personal reasons (Mar. 5 vs. Toronto) and was a DNP-CD on six occasions (Feb. 29 and Mar. 12-19) in which he dressed in uniform despite being injured…missed nine games from Jan. 30-Feb. 21 and a pair of games from Mar. 8-10 due to a sprained left ankle…was placed on the inactive list the final 15 games of the season after undergoing ankle arthroscopy and debridement surgery to remove a large bone spur in his left ankle on Mar. 21…set single-season career highs in scoring average and free throw percentage and tied his single-season high in rebound average…led the HEAT in charges drawn and offensive, defensive and total rebounds…was the HEAT’s leading scorer twice and also topped the team in rebounds a team-high 27 times, in minutes 15 times, in blocks on seven occasions and in steals five times…scored in double figures on 30 occasions, including three 20- point performances…scored in double figures a career-high nine consecutive games from Dec. 6-20…grabbed double-figure rebounds a team-high 17 times and recorded a team-high 11 double-doubles…grabbed his 2,500th career rebound at Indiana on Nov. 2…reached the 10,000 minutes played mark at Denver on Dec. 2…Season Highs: 24 points (vs. Indiana, Dec. 15), 16 rebounds (twice), four steals (at Atlanta, Dec. 19), three assists (nine times), one block (18 times) and 48:45 minutes (vs. Orlando, Dec. 28). 2006-07 SEASON: Started each of the 79 games in which he appeared and averaged 10.7 points (.492 FG%, .680 FT%), 8.3 rebounds, 1.2 assists and 31.4 minutes…missed a pair of games with a groin contusion (Apr. 10-11) and one game as a healthy scratch on the inactive list (Apr. 16 vs. Boston)…ranked 16th in the NBA in rebound average and 29th in field goal percentage…led the HEAT in games played, starts, minutes, offensive rebounds, defensive rebounds, total rebounds and double-doubles…ranked second on the team in points, field goals made, field goal attempts and charges drawn…established career highs in both field goals made and attempted…topped Miami in scoring on four occasions, in rebounds a team-high 40 times, in steals and minutes nine times each, in blocks in seven contests and in assists twice…scored in double figures on 44 occasions, including six games of at least 20 points…grabbed double-figure rebounds a team-high 26 times and posted 21 double-doubles…hit a game-winning 10-foot jumper (the first game-winner of his NBA career) vs. Washington on Mar. 11 with three-tenths of a second remaining to give the HEAT a two-point win…hit a HEAT season-high 12 consecutive field goal attempts from Jan. 21 (last six) to Jan. 22 (first six)…scored a career-high 28 points at New Jersey on Nov. 10…handed out a career-high seven assists at Phoenix on Jan. 5…had his streak of 111 consecutive games played end on Apr. 10 at Charlotte when he sat out with a groin contusion…Season Highs: 28 points (at New Jersey, Nov. 10), 17 rebounds (at Atlanta, Nov. 18), seven assists (at Phoenix, Jan. 5), four steals (vs. Seattle, Nov. 7), two blocks (six times) and 48:51 minutes (at Atlanta, Nov. 18). 2005-06 SEASON: Appeared in a career-high 81 games (80 starts) and averaged 9.3 points (.508 FG% .789 FT%), 7.8 rebounds, 1.2 assists and 30.8 minutes…missed one game due to personal reasons (Feb. 4 at New Jersey)…topped the HEAT in games started, defensive rebounds, total rebounds and charges taken, ranked second in minutes played and offensive rebounds and was tied for second in games played…ranked among the NBA leaders in field goal percentage (tied-19th), rebounds per game (tied-21st), defensive rebounds (20th), total rebounds (21st), offensive rebounds (33rd) and double-doubles (44th)…scored in double figures 36 times, including one 20-point effort…grabbed double-figure rebounds on 22 occasions and registered 14 double-doubles…topped the HEAT in rebounds 28 times, in steals on 12 occasions, in minutes in seven contests, in blocks four times and in assists once…recorded a career-high five steals vs. Philadelphia on Apr. 14…Season Highs: 24 points (vs. Philadelphia, Apr. 14), 14 rebounds (three times), five steals (vs. Philadelphia, Apr. 14), four assists (four times), two blocks (twice) and 42:45 minutes (vs. Washington, Dec. 11). 2004-05 SEASON: Started each of the 80 games in which he appeared and averaged 10.9 points (.540 FG%, .791 FT%), 9.1 rebounds, 1.4 assists and 33.4 minutes…missed two games due to injury (Mar. 22 at Houston with a left shoulder separation and Mar. 26 at Charlotte with a neck strain)…ranked among the NBA leaders in field goal percentage (4th), rebound average (14th), offensive rebounds (14th), total rebounds (16th), defensive rebounds (18th) and double-doubles (tied-28th)…set career highs in minutes, points, field goal percentage, free throws made and attempted, offensive rebounds, defensive rebounds, total rebounds, assists, steals and blocks…tied for the team lead in starts and ranked second on the team in field goal percentage, offensive rebounds, defensive rebounds, total rebounds, double-doubles and charges drawn…finished third on the team in minutes played, free throws made and attempted and steals…led the HEAT in scoring once, in rebounds on 31 occasions, in steals 15 times, in blocks 11 times, in minutes on eight occasions and in assists once…scored in double figures 47 times, including three games with at least 20 points…grabbed double-figure rebounds in 33 contests and posted 23 double-doubles… recorded one 20-point, 10-rebound, 5-assist game, amassing 20 points, 13 rebounds and a season-high six assists at Milwaukee on Dec. 8…in the Dec. 8 contest at Milwaukee he also set career highs in both free throws made and attempted going a perfect 12-12 from the line…grabbed at least one offensive rebound in a career-high 66 consecutive games from Nov. 26-Apr. 19, the second longest streak in the NBA in 2004- 05…grabbed a career-high 18 rebounds at Indiana on Feb. 23…grabbed eight offensive rebounds vs. Boston on Dec. 21, matching his career high…started for the Sophomore team in the Rookie Challenge at All-Star Weekend in Denver and had four points, five rebounds, four assists and one steal in a game-high 31 minutes…Season Highs: 22 points (at Golden State, Jan. 12), 18 rebounds (at Indiana, Feb. 23), six assists (at Milwaukee, Dec. 8), four steals (at Orlando, Feb. 27), three blocks (at Boston, Apr. 15) and 48 minutes (at L.A. Clippers, Jan. 14). 2003-04 SEASON: Started 24 of the 75 games in which he appeared and averaged 7.3 points (.459 FG%, .765 FT%), 6.3 rebounds and 23.9 minutes…missed seven games due to injury (Dec. 29-Jan. 10) with a right knee sprain, strained MCL…was an NBA All- Rookie Second Team selection…led the HEAT in offensive rebounds (the first time a rookie led Miami in offensive rebounds) and ranked second in double-doubles and third in rebound average, total rebounds and defensive rebounds…ranked among the NBA rookie leaders in rebounds per game (2nd), field goal percentage (5th), free throw percentage (9th), scoring average (10th) and minutes per game (10th)…set a HEAT rookie record by grabbing a season-high 17 rebounds vs. Boston on Jan. 20 and also scored 18 points in the contest…scored in double figures on 22 occasions, including two games with at least 20 points…scored 20 points at Dallas on Nov. 3 in just his fourth pro game, tying for the fourth fewest amount of games needed for a HEAT rookie to record his first 20-point game…grabbed double-figure rebounds 17 times and recorded 11 double-doubles…recorded his first career double-double with 16 points and 11 rebounds vs. Detroit on Oct. 31, in that contest he grabbed a career-high eight offensive rebounds…led the HEAT in scoring twice, in rebounds 20 times, in blocks in 16 contests, in steals eight times and in minutes once…was Miami’s top scorer off the bench in 14 contests and led the HEAT reserves in rebounds 36 times…was selected to play in the Rookie Challenge during All- Star Weekend in Los Angeles and finished with nine points, three rebounds, a game-high three steals and one assist in 15 minutes…was just the fourth undrafted rookie ever to play in the Rookie Challenge…Season Highs: 20 points (twice), 17 rebounds (vs. Boston, Jan. 20), three assists (twice), two steals (eight times), two blocks (at Portland, Nov. 19) and 44 minutes (vs. Detroit, Feb. 2). 2002-03 SEASON: Played for Chalon Sur-Saone in the top league in France and averaged 17 points and nine rebounds. 2004-05: Started for the Sophomore team in the Rookie Challenge at All-Star Weekend…2003-04: NBA All-Rookie Second Team…was a member of the Rookie team in the Rookie Challenge at All-Star Weekend. Was a four-year starter at the University of Florida and left as the all-time winningest player in the program’s history…appeared in 130 games and averaged 13.7 points, 6.4 rebounds and 1.1 assists…did not miss a game in his career and started the final 99…is the first player in school history to play on four straight NCAA Tournament teams and to be named All-SEC by the league coaches…was the first Gator to be named to an Associated Press All-America team…as both a junior and senior he was a First–Team All-SEC selection and was a Third Team All-SEC selection in both his freshman and sophomore seasons…finished his career at UF tied for first in games played and ranked in the top 10 in starts (2nd), free throws attempted (2nd), scoring (3rd), free throws made (3rd), field goal percentage (4th), dunks (4th), blocked shots (5th), blocks per game (6th) and double-doubles (7th)…as a senior, was an Associated Press Honorable Mention All-American and was a finalist for the Naismith Player of the Year Award, the Wooden All-American Team and the inaugural Senior CLASS Award…was a team captain and led the Gators in scoring, rebounding, field goal percentage, double-doubles, free throws made and attempted and blocked shots…led the SEC in field goal percentage (26th in NCAA)…as a junior in 2000-01 was an Associated Press Third Team All-American and a finalist for the Wooden All-American Team…led the SEC in field goal percentage (11th in NCAA) and ranked second in defensive rebounds and 10th in free throw percentage…led the Gators in scoring, blocks and free throws made and attempted…averaged 20 points in the NCAA Tournament, fifth among all players in the tournament…as a sophomore, was named to the NCAA All-Final Four Team and to the East Regional All-Tournament Team…set a UF NCAA Tournament record with 27 points in the NCAA Championship game vs. Michigan State…his 10-12 shooting performance (.833) from the field was second only to Bill Walton’s 21-22 (.955) in a championship game…his 85 points scored in the 2000 NCAA Tournament was the third highest total among players in the tournament. Full name is Udonis Johneal Haslem…nickname is “U.D.”…married his college sweetheart Faith Rein in the summer of 2013…has three sons, Kedonis (who is on a football scholarship at the University of Toledo), Josiah and Elijah…has two brothers and three sisters…lists his late brother, Samuel Wooten, who died of cancer at the age of 36 in 1999, as the person that made a difference in his life and the person that he most admired…it was Samuel who always took him to the court and had him play with older players…was a leisure service management major at UF…chose his major because it dealt with planning recreation activities and running Boys & Girls Clubs in the community…was inducted into the first class of the Miami Senior High School Hall of Fame in April 2009, into the University of Florida Hall of Fame in March 2012 and into the Miami Sports Hall of Champions in September 2016…received the Alumnus of Distinction Award from the Miami Dade County Public School system in May 2017…started the Udonis Haslem Children’s Foundation in 2005 to help local kids in need…the mission of his foundation is to promote youth development and self-confidence through programs and services designed to enable kids to reach their full personal and educational potential…since its inception the foundation has provided Thanksgiving meals in Overtown and Liberty City as well as to families affected by AIDS and has hosted various toy giveaways…his foundation has an annual back-to-school kickoff celebration to distribute school uniforms and school supplies to underprivileged school-age children that are homeless, victims of domestic violence, abused and fostered…supports the Grandmothers Raising Children Foundation, as well as other various local charities…hosts an annual silent auction and benefit dinner to help raise funds for his foundation…went on a four-day goodwill tour to Jamaica in August 2009 distributing school supplies, clothes and athletic gear to children…is a partner in JFC Miami which received the Franchise Company of the Year Award at the Black Enterprise Entrepreneurs Summit Small Business Awards on May 18, 2017 in Houston, TX…in December 2013 he opened his first SUBWAY restaurant in Hollywood, FL and now has six SUBWAY restaurants…having struggled with his weight in college he’s a longtime patron of SUBWAY and makes random appearances at his restaurants and personally prepares sandwiches for his customers…also is a licensed operator of each of the following businesses: Starbucks (2) and Einstein Bros. Bagels (2), a franchise investor of Auntie Anne’s (2) and a partner in 800 Degrees Pizza (1)…in 2018, he opened his most recent Einstein Bros. Bagels location at the Brightline Miami Central Station and opened his first 800 Degrees Pizza (with teammate Dwyane Wade) in Aventura…has endorsement deals with Check Cashing USA and Li-Ning…enjoys football and his favorite teams are the Miami Dolphins and Miami Hurricanes…was asked to speak to the Dolphins at training camp in 2017 by Head Coach Adam Gase…played football until the 10th grade before a knee injury forced him to the sidelines…wears size 18 sneakers.